90s maternity denim, re-appropriated into a unisex uniform for the downtown crowd. 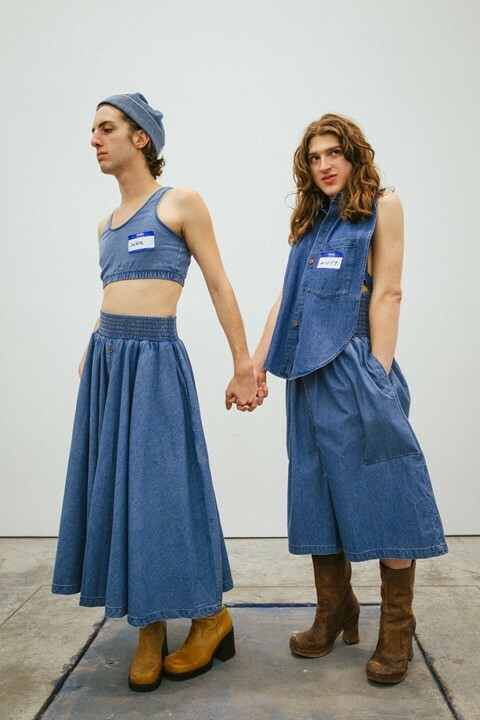 Self-proclaimed “No-gender, No-demographic” denim label 69 Worldwide teamed up with DIS magazine to present their AW15 collection in an all-white gallery space. The idea of rejecting conformity was present both in the unisex silhouettes and in the staging of the show itself – models lounged around holding hands and braiding each other's hair, the informal set-up feeling more like a group of friends hanging out than a fashion event. The brand’s fabric of choice took the form of draping halter-necks, super-sized shirts and swamping bucket hats. The models wore Walmart-style name tags, with #Heelconcept enthusiast Misty Pollen, Dazed contributor Patrik Sandberg and VFiles’ star intern Sabrina amongst the congregation.